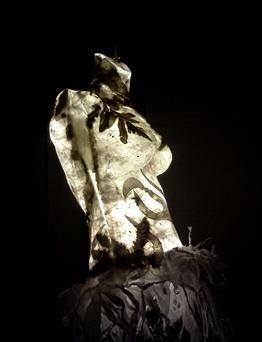 During the week of October 14, 2013, UPMC and local Pittsburgh artists began unveiling mannequin works of art to highlight Breast Reconstruction Awareness (BRA) Day on October 16, 2013. The concept of BRA Day originated 10 years ago in Canada and this is only the second year that it is being observed here in the United States. The idea was embraced and is promoted by the American Society of Plastic Surgeons (ASPS) as an initiative to increase awareness, education, and access for post-mastectomy patients. According to Carolyn De La Cruz, M.D., Assistant Professor of Surgery, Department of Plastic Surgery at the University of Pittsburgh, and BRA Day Chair, a large number of breast cancer patients do not undergo reconstruction. “So our concept was to target that segment and educate patients, people, or other doctors and healthcare providers about their options.” De La Cruz (and other plastic surgeons) believes that it is very important for women to choose reconstruction. This is why she also thinks it is so important for women to be given all of their available options—so they actually know what their choices are and can determine what is going to work for them. The mannequins were decorated by 15 local artists including Alix Paul, Laura Jean McLaughlin, Jim West, Katy Dement, and Sandy Kessler—many of the artists are survivors themselves or have been touched personally by cancer in some way. “The artists either changed or decorated the breasts of the mannequins, so not only is it an outward manifestation of the journey that breast cancer patients go through, it also ‘shows’ what they feel on the inside too—it’s really quite amazing,” notes De La Cruz. They will be displayed throughout the month of October beginning on the 16th (which is BRA Day). The display will culminate in an auction of the mannequins on November 6, 2013 at the Andy Warhol Museum. Informational tables with educational materials accompany the displays, including the wide variety of breast reconstruction options, the quality of surgical outcomes women should expect from reconstructive surgery, and the importance of timing breast cancer treatments with breast reconstruction surgery. “Again, we want to help women undergoing any form of breast cancer surgery to understand their reconstructive options,” notes De La Cruz. For more information on the exhibit please visit: www.bradaypittsburgh.org. See: www.upmc.com/Services/plastic-surgery for information on plastic and reconstructive surgery at UPMC.